Marks and Spencer has announced that Morrisons boss Marc Bolland will become its new chief executive. Mr Bolland, 50, would take up the post at a date yet to be confirmed in the new year, M&S said. M&S executive chairman Sir Stuart Rose said Mr Bolland brought "a wealth of consumer marketing experience". M&S said Sir Stuart would stay as part-time chairman to "ensure a smooth transition". 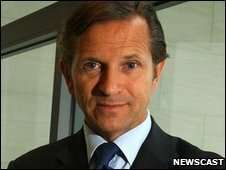 Sir Stuart has previously said he will leave M&S by July 2011. In a statement, Mr Bolland said: "M&S is one of the world's great brands and I am very pleased to be given the opportunity to lead the company forward at this exciting stage. "I am greatly looking forward to working closely with Stuart and the M&S team." Mr Bolland was appointed chief executive of Morrisons in September 2006. Before that, he worked for Heineken in the Netherlands. Sir Stuart came under criticism from M&S shareholders after his job changed in June 2008 to combine the role of chairman and chief executive. He had previously just been M&S's chief executive. Critics said combining both roles broke corporate governance rules, as it gave one person too much power at the company. Many observers had expected the new chief executive to come from within M&S, and were surprised by the external appointment. "We'd expected Ian Dyson, the finance director, to be appointed chief executive. It's a big shock," said Sam Hart at broker Charles Stanley. "Mr Bolland has an extremely good track record at Morrisons. Given that it's probably the biggest job in UK general retail I dare say he was unable to turn it down. It's definitely a good appointment in our view, but certainly a surprise," he added. The City reacted well to the appointment, with M&S shares rising 21.7 pence, or 6%, to 390p. Morrisons shares fell by 5%. Sales at M&S have been falling during the recession, although the company's latest sales figures show that the retailer is starting to recover. UK like-for-like sales, which strip out the impact of sales at new stores, fell 0.5% for the three months to 26 September. While this was the eighth quarterly fall in a row, it was better than the 1.4% drop seen in the previous quarter.